We recently sat down with Dr. Jia Wang, a Senior Research Scientist here at CRESST, UCLA for an interview about her recent publication and research. 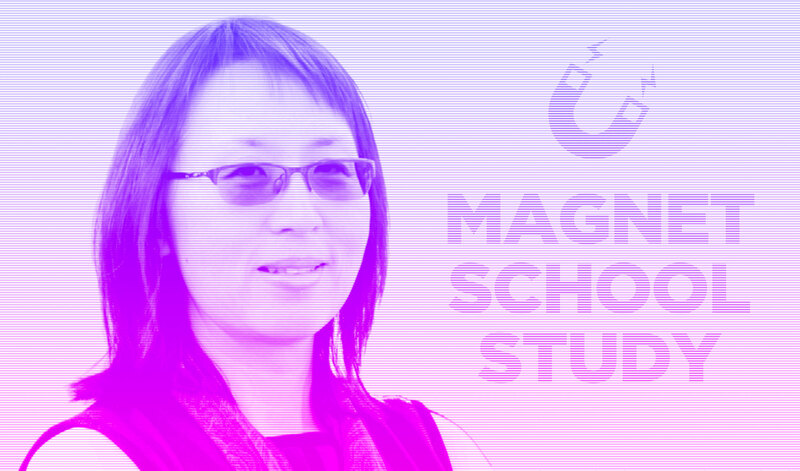 In our interview, she gives us the 411 on magnet schools – what makes them work and why they’re important. Q. Can you tell me a little bit about your new publication? My new article, A research synthesis of magnet school effect on student outcomes: Beyond descriptive studies in the Journal of School Choice, is a synthesis of research on the relationship between magnet schools and student academic outcomes. There’s currently a lack of understanding about the relationship between magnet schools and student outcomes, so my co-authors, Joan Herman and Daniel Dockterman, and I chose 18 studies to review from a large pool of research conducted between 1984 and 2016. For this synthesis, we classified these studies into three sets based on methodological rigor. The first category is the gold standard of research which is randomized studies or trials that use a lottery. The next category includes studies that have a quasi-experimental design and control for both prior achievement and prior demographic information. The third group of studies are quasi experimental studies that control for either prior achievement or prior demographics, but not both. In all of these studies, we also looked at student outcomes related to subject area (ELA or math) and also the grade span, whether the study focused on elementary, middle, or high schools. We found that the less rigorous the study is, the more positive the results are. While the more rigorous studies showed less positive results, overall we did find that magnet schools do have a positive effect on student outcomes. Another interesting thing, we found that a positive effect is more likely to happen in secondary magnet schools as compared to elementary levels. We didn’t find any differences in student scores between ELA and math where the results are pretty similar. 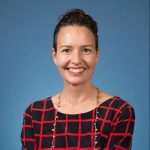 Something that we’ve also been noticing in our own research on magnet schools is that magnet schools are difficult to study because each one has such a local and unique context. The focus could be in arts, engineering, math, or even global studies. Sometimes a magnet school could be a program within a larger school or it could be school-wide. In some, local resident students have priority to get in and there are only a certain number of seats open via lottery to students outside the school zone. As a result, magnet schools differ dramatically from one to the next. We also know, based on our observation and experience, that the manner in which a magnet theme is embedded into instruction also differs from school to school. In the elementary level, the magnet theme is more embedded into the curriculum because it’s just one teacher who teaches multiple subjects, so that person can more easily adopt the magnet theme into their classroom, integrated into instruction. 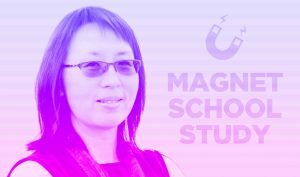 But in secondary schools, it is more likely that the magnet theme will be included in the curriculum as a set of electives. So the students in the secondary magnet schools can opt-in to the theme by selecting magnet-driven instruction as elective courses. Q. What kind of work are you doing here at CRESST related to magnet schools? We did evaluation work with the magnet school grant cycles in 2010, 2013, and 2016. Now we are gathering the data for the 2016 cycle of magnet work, and in the process of starting the 2017 cycle work. 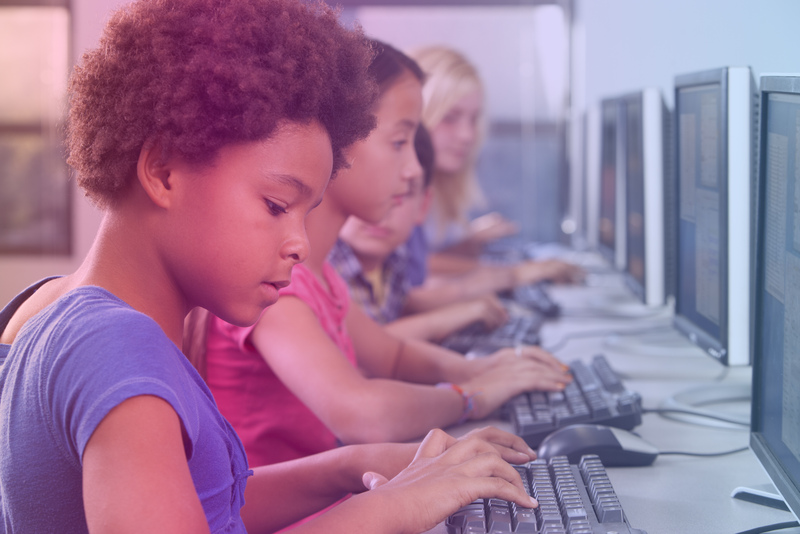 We work with districts that get magnet funding to see whether their magnet schools are doing better or not as compared to similar, traditional schools within the districts. The process of obtaining the data is a little bit more rigorous now as we and other researchers work within the What Works Clearinghouse Guidelines (WWC). With these guidelines, schools need to provide evidence of a range of outcomes so that we will all be on the same page. This helps to inform other researchers or other magnet schools of our results. The results across magnet schools can also be aggregated to provide guidelines for parents, students and the schools’ interventions. Q. In the evaluation studies that CRESST has done, what are some of the key findings that have come out of that work? We found that the magnet school effect is more prominent in the secondary level. Though overall, magnet schools do have positive effect. We also found that implementation matters. In the journal article we published in Jaspar in 2017, we reported on a study in which we looked at 24 magnet schools that received funding in the same cycle across five school districts. We looked at their academic outcome and also their site visit scores. We found that at least 75% of the variation in magnet school effect is explained by the magnet school site visit ratings. The two factors that stood out from the site visit ratings are: how much the magnet school implemented the magnet plan as presented in the original proposal, and, what the magnet school coaches actually did with their time. For example, what was the percentage of time they spent meeting with classroom teachers to help them with instruction? These are the key findings we observed here at CRESST. Q. How do magnet schools compare to charter schools in today’s school choice environment? Magnet schools enroll about 2.5 million students in the United States. It’s the second program choice in America right after charter school. The difference in enrollment is less than 100,000 students between the two school types. Since 1984, the federal government has been allocating about $100 million per year for magnet school development. In the most recent budget, magnet school funding remains level at about $100 million, while charter schools have gotten an additional boost of $167 million for a total charter school request of $500 million. Q. How is magnet school funding distinct from other public school funding? The magnet school funding of $100 million per year is for districts to either set up new magnet schools or convert traditional public schools into magnet schools. The additional funding is only for the school’s initial years. Part of the magnet school mission now includes creating innovative classroom instruction and promoting student achievement, so the funding supports that innovation. At the end of the initial three years, the additional funding goes away. Q. Do you think that magnet schools play an important role in the education landscape today? I think definitely, especially in the current school choice environment. Magnet schools have been very important over the past 15 to 20 years. We are all trying to figure out what schools are doing, why schools are doing well, and why schools are not doing well. A typical American school is zoned to the residents. In contrast, with magnet schools we are giving parents a choice to send their children to special schools that are more aligned with their child’s interest. That way we keep the parent and the students inside the public-school system. This is something that I feel strongly about. With magnet schools you give parents a choice but the allocated funds still stay within the public-school environment instead of leaving the district. Q. Where would you like to take your research next? We are interested in doing a longitudinal study in the near future. Some magnet school experts say that the magnet school experience has a long-lasting effect that you can’t just measure at the time of the magnet school enrollment. We speculate that magnet schools have effects beyond the typical test scores, for example, in course taking, in graduation rates, and dropout rates. These are non-typical academic outcomes that may actually provide more significant information than typical test scores. This would be a great study to do in the future. Teens learning data science is in the news!